The Fifty Best held a “blind” tasting of recent release New York State cabernet francs and rieslings with 14 pre-qualified wine judges. All three major New York State wine regions were represented in this tasting. Strict tasting rules were applied. The order of service was established beforehand by lottery. Each of the wines were poured into fresh glasses from new sealed bottles and served at room temperature. Only ice water and white bread were available to cleanse the palate. 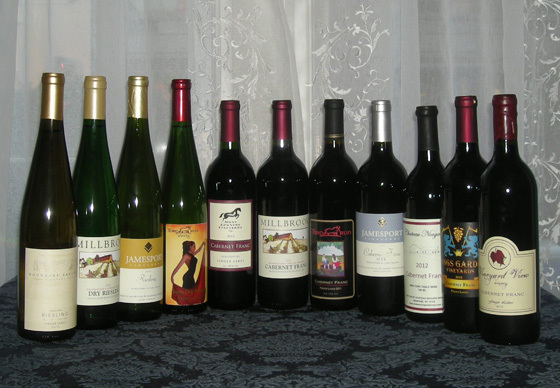 Rieslings were tasted as a group first, and then the cabernet francs. The tasting notes that follow are summaries of the judges’ opinions, with all replicated notes eliminated. The regions are identified for each brand. Prices indicated do not include tax. This wine is made from a blend of Cabernet Franc (92%) and Merlot (8%) – sourced from the Mattituck Farm – with barrel aging in French oak for 18 months. Aroma: Dark cherry, red cherry, tea berry, blackberry jam, fruity, tutti frutti, lemon, very juicy, violets, rose, floral, herbal, dark chocolate, some earth notes, mushroom, tobacco, wood, oak, elegant. Palate: Aged cherry, black cherry, dark plum, currants, briar fruit, lemon, juicy, chocolate notes, earth, leather, wood, oak, tannic, perfect acid, excellent food wine, well done, elegant. Finish: Lemongrass, tart, leather, oak, complex, layered, balanced, flavorful, soft, elegant, super long. Grapes are harvested from a gently sloping, loamy vineyard on the eastern shore of Seneca Lake and following a gentle pressing and fermentation the wine is aged in oak barrels. Aroma: Ripe black fruit, dark cassis, black cherry, black currant, fig, apple juice, bell pepper, spearmint, crisp, earthy, forest floor, leather. Palate: Brambleberry, ripe berries, plum, cherry, currants, baked fruit, orange peel, juicy, bell pepper, peppery, mineral, light leather, tannins, high acid, well balanced, young, brash, will age well. Finish: Subtle cherry, currants, nice acidity, delicate, long. 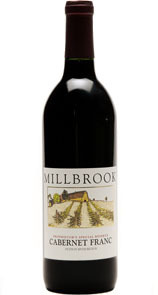 This wine is a blend of Cabernet Franc (90%) and Merlot (10%), with oak aging for 12 months prior to bottling. Aroma: Red cherry, raspberry, blackberry, cassis, blueberry, black currant, black cherry, plum, dark fruit, violets, lightly floral, light spices, minerals, earth, leather, oak, lovely. Palate: Dark fruit, sweet plum, juicy blackberry, raspberry, blueberry, berries, cherry, cranberry, hint of pepper, light spice, mint, big wood, juicy, medium tannin. Finish: Briar fruit, cherry, vegetal, wood, clean, flavorful. Grapes for this wine were harvested from a vineyard on the east side of the bluff on Keuka Lake, and were barrel fermented and barrel aged in American oak for 16 months. Aroma: Blueberry, raspberry, ripe berries, plum, cherry, currants, apple, bright lemon, slight bell pepper, floral, light leather. Palate: Plum, blackberry, strawberry, cherry, citrus, floral, butter, vanilla, clotted cream, mushroom, toasted oak, tannins, high acid, soft, round, perfectly balanced, layers of flavor. Finish: Fruity, cinnamon sugar, marshmallow, creamy, mint, subtle, silky, flavorful, elegant, long. Grapes for this wine hailed from the sandy, gravely soil of the Niagara plain that contains a good amount of limestone. Following ripening during a long, hot and dry growing season, the fruit was fermented with extended maceration and aged for 12 months in new Hungarian oak prior to sterile filtration and bottling. Aroma: Plum, black plum, dark cherry, deep red cherry, berries, grape jam, raisin, mint, forest floor, tobacco, leather. Palate: Plum, currants, bing cherry, blueberry, dark berry, chocolate, roasted coffee, light spice, light saddle leather, wood barrel, light oak, great structure, balanced, Old World style, great food wine, quite impressive. Finish: Black cherry, cherry strudel, faint cinnamon, mint, wood, holds up, long. This wine was produced from 100% Estate Grown Riesling grapes that were hand harvested. Following crushing and pressing, fermentation and aging took place entirely in stainless steel, with the resultant wine having 1.6% residual sugar. Aroma: Green apple, pear, orchard fruit, white grape, slight melon notes, lemon zest, honey, honeysuckle, hibiscus, faint white flowers, floral. Palate: Gala apple, juicy orchard fruit, peaches, white grape, kiwi, pamplemousse, drizzled honey, subtle green pepper, light lemongrass, almond, mineral, wood notes, good acidity, dry. Finish: Lemon, passion fruit, pineapple, chewy, short. 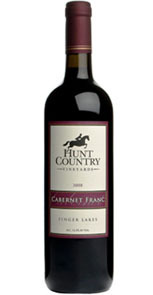 This 100% Cabernet Franc from grapes grown on Hunt Country Vineyard and Green Acres Farm was partially fermented in stainless steel, as well as in small batch open containers and was aged in French oak for 18 months prior to bottling. Aroma: Dark cherry, blackberry, sweet berries, currants, bell pepper, peppery, cinnamon, clove, sweet spices, mushroom, earth, forest floor. Palate: Tart cherry, dark cherry, red plum, blackberry, currants, jammy briar fruit, loads of fruit, luscious, yellow bell pepper, green bell pepper, slight vanilla, spicy, subtle anise, light leather notes, wood, oak, some tannins, low acid, nicely balanced. Finish: Light cherry, sour cherry, dark fruit, hint of blackberry, lemongrass, musty, nice, delicate, clean, short. Made from a single clone of Riesling (Geisenheim #110) from vines planted in 2009 and 2010 in a vineyard on the east side of Seneca Lake, this wine underwent slow, extended fermentation in stainless steel and has a residual sugar of 3.7%. Aroma: Pear, gala apple, peach, grape, grapefruit, honeysuckle, bell pepper, vegetative, slightly floral, light leather, slate. stone. Palate: Sweet apple, apple cider, peach, subtle pear, hint of melon, honey, floral elements, violets, tangy, medium acidity. Finish: Granny Smith apple, honey, very light citrus, fresh, clean, tangy. Grapes for this wine were sourced from a hillside vineyard, with soil containing large amounts of shale, and totally fermented in stainless steel. Aroma: Juicy pear, golden apple, white peach, apricot, acacia, light floral notes, hint of lavender, slate, mineral, elegant. Palate: Green apple, juicy pear, peach, apricot, stone fruit, honeydew, citrus, lemon, lemongrass, slightly tart, light vanilla, minerality, dry. Finish: Citrus, crisp, light buttery, delicate, ripe, round, long. This wine is produced in the “classic style,” with cool fermentation at 55 degrees Fahrenheit, resulting in the development of excellent acidity (3.4 Ph). Aroma: Honey, green apple, white mulberry, herbaceous, mineral, subtle white oak, wood notes. Palate: Pear, orchard fruit, white grapes, citrus, bell pepper, rose petals, mushroom, mineral notes, wood, nicely balanced, dry, great with oysters. Finish: Lemon, hint of lemon creme, yellow delicious apple, tangy fruit, creamy, white pepper, slate, mineral. Grapes from this wine were hand-harvested from a vineyard four miles “up the road” from the winery. Following fermentation the wine was aged in a mix of new, one-year-old and two-year-old French oak for 18 months prior to bottling. Aroma: Cherry, red cherry, plum, dark fruit, tutti frutti, sweet spice, light chocolate, light leather, earth, oak. Palate: Cherry, plummy, dried plum, plush red fruit, subtle lemon, tart, mineral, light oak, wood, tannic, high acid. Finish: Plum, tart, light spice.